Stretching out from Gawky Hill a gently undulating landscape of green fields, farm houses, small woods and low hills marked a change in the Watershed. 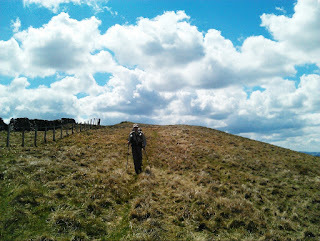 The crossing of the Southern Uplands was over. Ahead lies the Central Belt, the Lowlands, where the Watershed winds sinuously between the great rivers of the Clyde and Forth. Here there are many villages, roads, fenced fields and the only town of any size on the Watershed, Cumbernauld. Looking back, the big, pale brown rounded hills of the Southern Uplands faded into the distance. 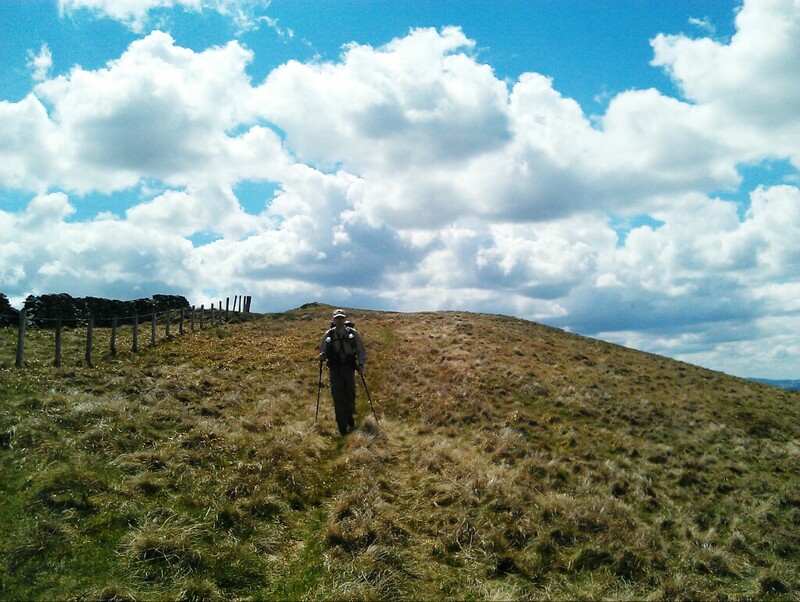 They had given fine walking and wild camps, especially on the first two days out of Moffat on the great Moffatdale Horseshoe, which I'd traversed in sunny weather with my friend Tony Hobbs (who you can see in the picture above). After those big hills the Watershed dropped a little as I turned north towards the Lowlands. Much of the rolling hill scenery was still enjoyable though the encroachment of a giant wind farm (how large - well, big enough to need road signs, one of which read 'Array A - 17km) with turbines almost on the Watershed itself has destroyed any feel of nature or wildness for many kilometres. The presence of several anemometers suggests yet more turbines are likely. At present though wind farms only sully a small part of this first section of the Watershed and mostly it gives wild walking and a remote feel enhanced by the often tough terrain and lack of paths and buildings.